I always find it interesting what people in the arts consider a “day job.” I have always had a job outside the arts, so to me, any job related to music has not been in that category. I have a composer colleague with a DMA in choral conducting who considers his work at the college where he conducts choirs and teaches to be his day job. To me, he doesn’t have a day job, but a full life in music! The Boston Singers’ Resource once ran an excellent article reframing the idea of day job as Correlating Career. I really like this mindset. I won’t rehash that post, because you should just read it yourself. When I was younger, I had it in my head that if I wasn’t poor, I wasn’t doing it right. I thought that putting effort into earning money outside of the arts meant I didn’t want music enough. That is hogwash! Of course, graduating school during the Great Recession was the biggest factor in my low earnings during the start of my career(s); but my mindset didn’t help. What I wish I’d known was that office jobs not only pay more, but are easier on the body than retail. Moving from retail, up to retail banking, then finally to office work meant that I was physically able to practice at the end of the day. The additional earnings helped me afford lessons, coachings, and the other financial costs of singing, not to mention an increased standard of living overall. If you are smart and capable, you are throwing away money if you don’t use your abilities in your day job. The key is balance. Burn out is no way to live, no matter what you are pursuing in life. Sleeping, eating, exercise, and relationships are all important parts of being human. While singing in Candide this summer, I decided that working full time at an office, doing my church job, and being in twenty hours a week of rehearsals wasn’t how I wanted to live. Granted, shows tend to be for defined periods of time. But I want my life to always be structured so that I can say yes to any performance opportunities that present themselves. I looked at my finances and schedule, and decided that I could cut down to a part-time office job. So, since the beginning of 2019, I work part-time at a church, part-time at an office, and do freelance singing. Maybe soon I’ll be teaching yoga! For me, this life of variety is ideal. I marched on Washington with a woman who wanted to make a career in the arts no matter what, so she found her niche, combining a love of history with performance. I really admire her drive and what she has done with her company. Personally, I like the artistic freedom I have now to say no to opportunities that don’t suit me, so I choose mixed income sources. I have a colleague who has some strong opinions about who should label themselves “professional.” I think her main point is that it doesn’t do the field any good to ignore that full-time artists in America have a nearly impossible hard time. Claire is one of those full-time artists, and if you heard her sing, you would also be ticked that she has so little stability. But I don’t agree with her that you need to be singing full-time to be allowed to label yourself a professional. I think everyone needs to do what works for them and for those who depend on them. Sometimes the hustle is fully in the arts, sometimes it’s a life of dabbling in artistic pursuits, and sometimes it’s a combination of varying hustles. If you do work truly worthy of payment and someone pays you, you are a professional, and you shouldn’t feel bad if you also do other things. I have embarked on a new adventure! About eight years ago, I took up yoga in earnest as a way to keep my instrument healthy. I love yoga for its benefits for singing: body awareness, breath, lower ab work; but I also fell in love with it besides. My love of yoga comes down to this: I love building strength and getting my exercise in while having fun. So I’m taking the leap and learning to be a yoga teacher. I am about halfway through the certificate part of this journey. I have already learned so much about myself, both physically and otherwise. Learning about anatomy and talking about yoga students’ limitations has taught me that I have been a very bad yoga student when it comes to certain parts of my body. Type A’s like me hear, “don’t go too far,” and think that advice is for someone else. We hope pain or negative sensation will just go away. Learning how the hamstring works helped me admit that I was headed towards injury. Learning to back away is empowering in its own right, a sort of empowerment I’m sure I will need as a person with a body that won’t be getting younger. In the otherwise category, I’ve been reminded how much I love teaching. It has been some time since I taught voice lessons or classes, and it may be time for me to get back in that game. I did a lot of research before making the leap to using digital scores. While I found a lot of useful online recommendations for instrumentalists, I had to harass fellow singers in person to get their take. It’s always nice to talk out your own situation with someone you know, but I want to add my thoughts to those online, for any singers thinking about going digital. Going digital is far from required, and I would certainly only recommend it if you are going to use the iPad in other facets of your life. For me, the timing had as much to do with my 2009 MacBook’s senility as the desire for a lightweight music library. 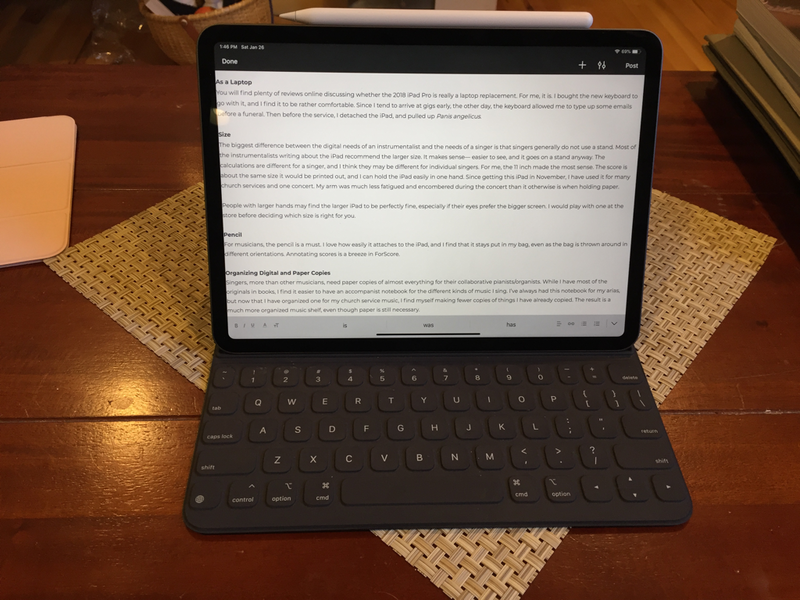 The iPad Pro is expensive and was only worthwhile to me as a laptop replacement, music library, and e-reader. You will find plenty of reviews online discussing whether the 2018 iPad Pro is really a laptop replacement. For me, it is. I bought the new keyboard to go with it, and I find it to be rather comfortable. Since I tend to arrive at gigs early, the other day, the keyboard allowed me to type up some emails before a funeral. Then before the service, I detached the iPad, and pulled up Panis angelicus. The biggest difference between the digital needs of an instrumentalist and the needs of a singer is that singers generally do not use a stand. Most of the instrumentalists writing about the iPad recommend the larger size. It makes sense— easier to see, and it goes on a stand anyway. The calculations are different for a singer, and I think they may be different for individual singers. For me, the 11 inch made the most sense. The score is about the same size it would be printed out, and I can hold the iPad easily in one hand. Since getting this iPad in November, I have used it for many church services and one concert. My arm was much less fatigued and encombered during the concert than it otherwise is when holding paper. People with larger hands may find the larger iPad to be perfectly fine, especially if their eyes prefer the bigger screen. I would play with one at the store before deciding which size is right for you. ​For musicians, the pencil is a must. I love how easily it attaches to the iPad, and I find that it stays put in my bag, even as the bag is thrown around in different orientations. Annotating scores is a breeze in ForScore. Singers, more than other musicians, need paper copies of almost everything for their collaborative pianists/organists. While I have most of the originals in books, I find it easier to have an accompanist notebook for the different kinds of music I sing. I’ve always had this notebook for my arias, but now that I have organized one for my church service music, I find myself making fewer copies of things I have already copied. The result is a much more organized music shelf, even though paper is still necessary. I bought both Apple’s keyboard cover and the smartcover. The smartcover is lighter than the keyboard and less awkward to hold when singing, so when I know I will only be using the iPad as a music or book reader, I will throw the smartcover on it, and slip it in my bag. 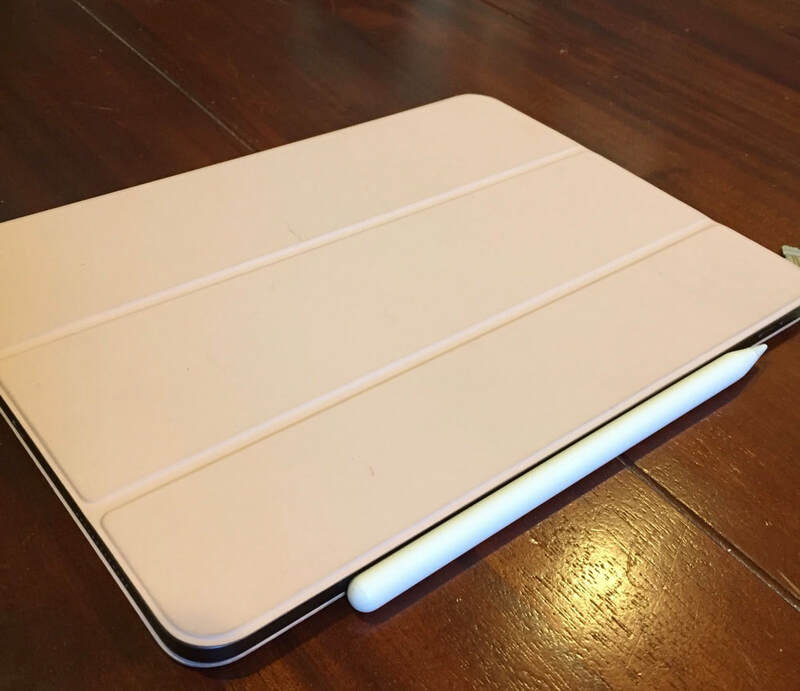 I chose the darkest color iPad, so that when I sing in a serious concert, I can do so with no cover, but I like the light pink cover for everyday use. I love having my music library at my fingertips, especially for things like funeral services, where you don’t always know what music you need before you show up. I can pull out music to practice without having to plan ahead, and the same device also holds books to read, and serves as a laptop. The advantages are numerous. I’m sure I will have more to say as I use the iPad more, but I wanted to offer this starting point for anyone else thinking about going digital. Hello again world, I have decided to share curated thoughts with you again! I have blogged in the past on various topics—singing, food, travels. Now I am back with an even broader approach. I want to put things onto the internet that I wish I could find. For instance, I will be sharing my tech device recommendations for singers like myself, then I will swerve into life advice. The main question I will answer finally, for all those dying to know, is how does one build a life like AS-K’s. I have always enjoyed writing but, being a performer, I find it hard to do without an audience. My goal is to entertain and inform. Topics will include those mentioned above, in addition to: singing technique, yoga, the early history of the women’s suffrage movement in America, sourdough bread, how to hustle, and Catholic music.